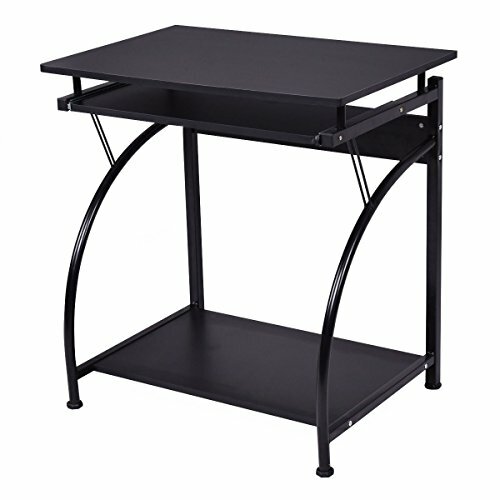 The computer desk with a chic but pratical design provides you with ample working surface and makes it comfortable to work with a computer or have your daliy supplies organaized. The desk is a fabulous solution for a youth bedroom or anywhere you need a compact option for writing, reading and more. It features a smooth slide-out keyboard shelf and a full size workstation, allowing you to lay out your tasks and dedicate yourself to what you've focused on. An extra bottom shelf provides space for the computer host or books. Transform your limited home office space with this sleek and attractive table, get your own convenience and enjoy the sufficient workspace!